Replacement Coil Heads for the Aspire Cleito PRO Tank. 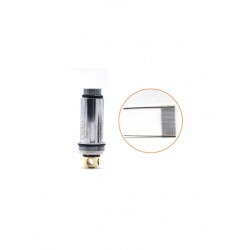 The revolutionary design of the Aspire Cleito coils which frees up a lot more restriction in the air flow system by removing the use of a static chimney inside the tank. The coil itself is essentially the chimney itself. This game-changing new idea results in an enhanced flavour profile and a significant increase in vapour production. Combined with a clapton type Kanthal coil for maximum flavour.